Ten minutes isn't a very long time in shooter. With action hurling itself fast and frenetically at the player, entire set-pieces can feel like they run seconds. It's hard to glean any lasting impressions over many of a game's subtleties. You come away with a couple of notes on the characters and weapons, but there's no overriding sense of a game's narrative. 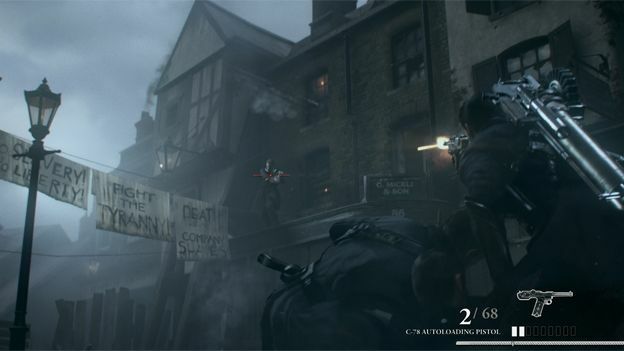 At least in the case of The Order: 1886, the ten minutes T3 was afforded hinted at a rich backdrop. Set in a Steampunk Victorian London, this PS3 exclusive Third Person Shooter tells the story of a group of Knights armed to the teeth with clockwork weaponry fighting a war for control of the streets. The back story we're given before heading into the action is that there's a rebellion being staged in the East End by the poor and the downtrodden. The Order is responding to one of their number who has been pinned down in an ambush. Right from the get-go it becomes apparent that The Order is a cover-based shooter set very much in the mould of Gears Of War. Players latch onto cover and much of the gameplay is pop-and-shoot based. The weapon our Knight – whose name, prosaically enough, happened to be Galahad – was using was something called a Thermite Rifle. It's a twin-shot weapon with which the player first coats their targets with aluminium oxide powder and then fires a flame shot that ignites the powder hanging in the air around their enemies, burning them alive. The Thermite rifle is also rather useful for burning away any wooden cover enemies happen to be hiding behind. We noted that the other members of Galahad's pack were sporting different weapons; there's the Arc Gun, which fires a stream of electricity and a Combo Gun, which seems to be a rifle/shotgun hybrid. During the firefight, we saw one of the Order use a liquid we were told was called 'Black Water'. According to the developers, not only does this substance have rapid healing properties, it gives the members of the Order a physical edge on their opponents. We also learned that the player characters have the ability to pick up and examine clues and items in their environment. As The Order members took cover from the mob in Whitechapel, Galahad was able to examine a map with several areas highlighted on it. Flipping the map over, we discovered a series of names on the back – some of which were crossed out. Without much background to the scene we were playing through, it was hard to make sense of what we were seeing, but the way Galahad examined this clue was very reminiscent of the detective mechanics in Rockstar's L.A. Noire. The plot snippets we were able to glean were miniscule. However, we were told one of the reasons The Order were in the East End wasn't just to quell a rebellion. They'd been told that the rebels were getting hold of the same hi-tech ordinance the Order normally carry, which was allowing them to push back against the attempt by the authorities to stop them.